Looking for an impressive dish for the holidays? It takes a little time to put this dish together, but it's simple to do...and the results are outstanding and delicious. Heat the oven to 425 degrees F. Place the beef into a lightly greased roasting pan. Season with the black pepper, if desired. Roast for 30 minutes or until a meat thermometer reads 130 degrees F. Cover the pan and refrigerate for 1 hour. Heat the oven to 425 degrees F. Beat the egg and water in a small bowl with a fork or whisk. Heat the butter in a 10-inch skillet over medium-high heat. Add the mushrooms and onion and cook until the mushrooms are tender and all the liquid is evaporated, stirring often. Unfold the pastry sheet on a lightly floured surface. Roll the pastry sheet into a rectangle 4 inches longer and 6 inches wider than the beef. Brush the pastry sheet with the egg mixture. Spoon the mushroom mixture onto the pastry sheet to within 1-inch of the edges. Place the beef in the center of the mushroom mixture. 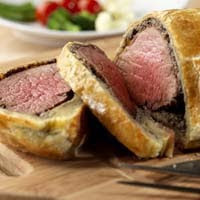 Fold the pastry over the beef and press to seal. Place seam-side down onto a baking sheet. Tuck the ends under to seal. Brush the pastry with the egg mixture. Bake for 25 minutes or until the pastry is golden brown and a meat thermometer reads 140 degrees F.
Serving Suggestion: Serve with green beans amandine. For dessert serve with cheesecake topped with sliced strawberries. This entry was posted on 6:12 AM and is filed under Beef . You can follow any responses to this entry through the RSS 2.0 feed. You can leave a response, or trackback from your own site.